From board games to bacteria leggings, our list of holiday gift ideas has something for every microbiologist on your list. Two player card game that increases familiarity with antibiotic misuse. The game takes place in the world of Soma where the Apothecary Healers must defend innocent citizens from invading Lords of Pestilence like Anthrax, Cholera and the Black Death. Take the game to the next level by purchasing the companion book which includes elaborate illustrations and descriptions of the Lords of Pestilence and Apothecary Warriors. Players build a protein chain by using Organelle Cards to link Amino Acid cards side-by-side. This competitive game can be a great addition to game night with friends or a fun educational tool in science classrooms. Jewelry can be a tricky gift to buy, but every molecular microbiologist would love receiving a piece from the Molecule Store. We especially like the DNA Double Helix Ring. Give this festive set of Giant Microbe ornaments to one special microbiologist or split the set among your lab mates. This Low-Mag Lens smartphone or tablet attachment is similar to a conventional optical microscope with 40x magnification. A perfect stocking-stuffer for all the kids on your list. 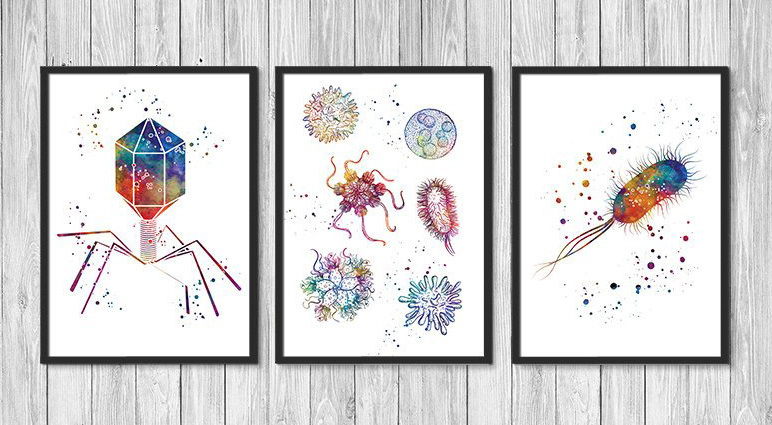 This detailed coloring book is packed with educational illustrations about viruses, bacteria, fungi and more. Beatrice the Biologist is the creator of witty science comics and apparel that support science education. 10% of the proceeds from her shop go directly toward funding science and math projects. Happy Holidays from the Microbiologics Team!